AMD has introduced two embedded processors as part of the new Ryzen R1000 series. The models are the Ryzen Embedded R1606G and the slightly lower-specced Ryzen Embedded R1505G. Both chips come with two cores and four threads. 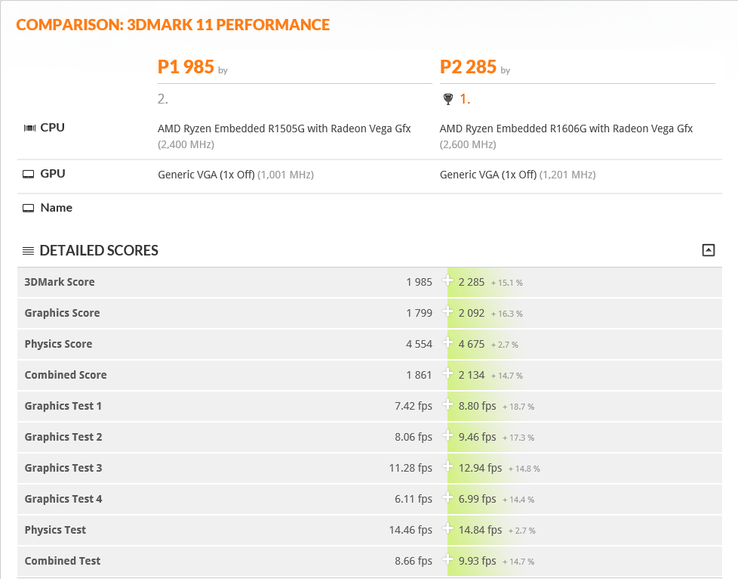 Strangely enough, it seems the two embedded chips were compared against each other on 3DMark 11 back in October 2018. 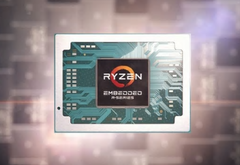 AMD has expanded its Ryzen Embedded portfolio with the Ryzen R1000 series, which is currently made up of the R1606G and the R1505G processors. The two chips have similar specifications but do differ in crucial areas. Both feature two cores and four threads, TDP range is 12 to 25 W, both have 1 MB level 2 cache and 4 MB level 3 cache, and they can support up to three 4K displays. Unsurprisingly, the differences are in the CPU and GPU clock rates (the AMD Ryzen R1000 series features Vega 3 iGPUs). The CPU clock rate for the AMD Ryzen Embedded R1505G goes from 2.4 to 3.3 GHz whereas the R1606G can manage 2.6 GHz to 3.5 GHz. The iGPU for the R1606G is set at a clock rate of 1.2 GHz and the R1505G’s iGPU is set slightly lower at 1.0 GHz. In a 3DMark 11 performance comparison, which was apparently carried out in October 2018, the AMD Ryzen Embedded R1606G unsurprisingly outscored its lower-clocked stable-mate. The 3DMark benchmark score for the R1505G was 1,985 points whereas the R1606G managed 2,285 points, which is just over 15% better performance. Similar result differences were offered in the Graphics Score (R1606G +16.3%) and the Combined Score (R1606G +14.7%). However, the Physics Score result was much closer at 4,554 vs. 4,675 (R1606G +2.7%).